As always, be sure to check out the Internet Statistics Compendium for further facts and figures. When it comes to digital experiences, personalisation is way down on the list of things consumers care about. This is according to Acquia, who undertook a survey of 1,000 consumers from UK and France this March. 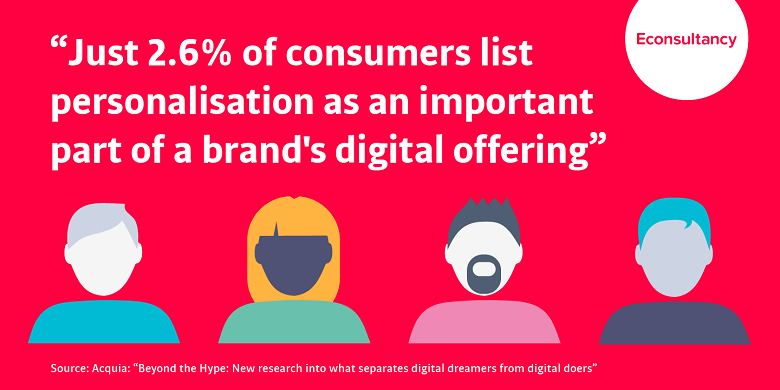 Just 2.6% of the survey respondents cited personalisation as an important part of a brand’s digital offering. Instead, the majority (65%) cited a website that’s easy to navigate. Alongside this, 13% said a good-looking website is more important, while 11% said engaging content, and 4% said a brand’s social media presence. However, despite the fact consumers seem to care less about personalisation, it could indicate that marketers are failing to deliver this with any real relevance or value (and the same goes for content and social media). In the long run – on top of basic features like an easy-to-use website – personalisation could still be a key differentiator. Artificial intelligence (AI) platforms are gaining a toehold among brands and marketing agencies, however, a new report by Albert has revealed that some are still hesitant to adopt the technology. According to a blind survey of 52 brand and agency marketers, 59% of brand respondents said they’re hesitant to surrender digital campaign data analysis to an AI, while 33% of agencies expressed reservations about giving up manual audience segmentation. Meanwhile, 63% of agency respondents cited an ‘inability to communicate with AI’ as a perceived drawback, and 32% of brand respondents cited the same concern. That being said, not all marketers are so resistant. The survey also uncovered optimistic feeling about the tech, with agencies ranking AI’s ‘ability to lift sales’ and ‘exceed campaign benchmarks’ as important performance benefits. Similarly, brands ranked ‘increased return on ad spend’ and ‘reduced costs’ as positive attributes. Despite a number of data breach and privacy-related stories hitting the headlines recently, research from the DMA and Acxiom suggests that consumer sentiment remains unaffected. According to a survey of 1,047 UK respondents, 61% of consumers say that (as businesses prepare for GDPR) they are already happy with the amount of personal information they share. Sentiment has also changed since the DMA commissioned a similar survey six years ago. 51% of the respondents now view data as essential to the smooth running of the modern economy – up from 38% in 2012. Interestingly, a change in attitudes has been greatest among 55 to 64 year-olds, with 63% saying they are happy with the amount of data they share today – this is compared to 47% in 2012. Critically, 88% cite transparency as one of the keys to further increasing trust in how their data is collected and used. Younger respondents are even more relaxed about privacy, with 38% falling into the ‘data unconcerned’ group. A new report from Mirakl has highlighted how a growing number of retailers are adopting the marketplace model, so much so that it’s predicted marketplaces will account for 40% of the global online retail market by 2020. In a study of the opinions of 50 leading UK retailers, it was found that an increasing number of retailers believe the marketplace model is the key to winning customers. 68% of retailers say that operating their own marketplace gives existing customers more reasons to shop with them. Meanwhile, 70% agree that a wider product offering helps to win new customers. As a result of this, 44% of retailers are already selling their product through a marketplace model or plan to in the near future. 48% of retailers are also operating or plan to operate the ‘dropship model’ to sell third-party products. New research by Barclaycard has revealed that UK shoppers abandon an online basket worth an average of £29.37 each month. This could amount to more than £18 billion of lost sales per year for retailers. The research also says that women’s clothing is the most abandoned category, followed by men’s clothing, and then entertainment items. More specifically, women’s knitwear is the number one most abandoned item, leather goods (such as wallets) is the second, while women’s lingerie and hosiery is the third. Meanwhile, 6pm to 8pm and 8pm to 10pm are said to be the peak times for online shopper drop-out, and 17% of shoppers who abandon items do so because they like to ‘window shop’ with no intention to buy. A Mailjet report (based on opinion from 400 marketers in the UK and France) suggests that the new ePrivacy law could see brands lose more than 40% of web traffic. As a result, 30% of respondents plan to reduce the amount of cookie-based display, paid search, and retargeting they carry out in the immediate aftermath of the new regulation. Under ePrivacy, internet users will have the option to set browser-level cookie permissions which could mean the withdrawal of millions of consumer datasets from brand view. While 85% of marketers are confident they know the difference between ePrivacy and GDPR, 93% of companies are currently still using cookie-based advertising to reach their customers. Despite the potential loss in traffic, marketers do feel ePrivacy will be a good thing for their company in the long term. 57% of marketers agreed they will rely less on tactics like retargeting ads and build more qualitative data insights to improve the customer experience.